Best tutor in the game. AKA the combo-finder. will the prophecy fetch trigger first? or do i draw 2 cards(including the prophecy) and then fetch 2 cards? The situation happened when Roald Ellsworth got killed by kopesh while the Prophecy was in play. Wasnt sure which one triggers first, the prophecy or the card draw? I understand Ellsworth is a disrupt effect and the college prospect is a forced response. FAQ page 18, both effects are triggered by College Prospect leaving play - Forced Responses trigger before Responses when they both want to happen simultaneously, so you must use College Prospect's Forced Response first, then your opponent has a Response option, then you have the option to trigger the Response on A Voros Hal'l Jon. Same thing for Ellsworth, his Disrupt takes precedence as it happens before he leaves play, once he's left play, you can then trigger the Response on the prophecy. So in other words, you cannot trigger the prophecy because you would draw it with either of the effects before it can trigger? 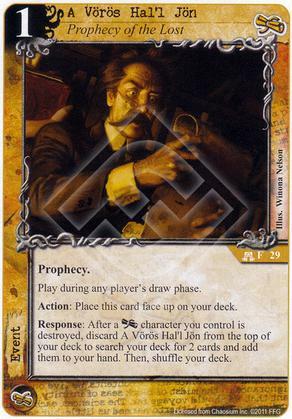 Ah yes, I forget that when a Prophecy goes on top of the deck it counts as the first card.